A chic restaurant that features contemporary Asian fusion cuisine, Bistro Wasabi in Lake in the Hills serves a varied menu. Specializing in traditional sushi, chefs Jino Kim and Mr. Park also add a bit of Latin, Korean, Italian and French influence to create dishes unique to Bistro Wasabi. Jino Kim gained a passion for Japanese cooking after moving to Pittsburg from South Korea. He infuses his talents and familial roots to create authentic Asian dishes with modern flair.Some of the kitchen's specialties include its tempura, sesame essence salmon and peppercorn ahi tuna. A full bar also serves a variety of Japanese beers, sake, wine and unique cocktails that are made to complement any dish. Open throughout the week, Bistro Wasabi serves dinner. Delicious! A favorite and we will keep coming back! Once again, amazing food an service. The Crackled tuna appetizer is a must! Thanks to Erica for taking great care of us. Great first time experience! Our server had wonderful recommendations. My husband and I enjoyed everything we had! Always a great restaurant! Best Sushi in the area, by far. Amazing food, as always. The Crackled Tuna appetizer is incredible! Thanks to Taylor for taking great care of us! 3 of 4 meals were great. The other was slightly warm when served. We'll definitely be back! Hands down, the best sushi this side of Tokyo. Another great dining experience here. Tried another one of the featured martinis - pecan caramel. I know, I know, a purist wouldn't go that route. And I hasten to say that my "go to" martini is Grey Goose on the rocks, extra dirty, bleu cheese olives. But BW's creativity keeps me trying the martini de jour. As usual, food and service were outstanding. Erica is 10+. Always amazing. Thank you for making all of our dinners with you special. Always enjoy the great food experience & wonderful service! 3 out of 4 of us ordered the Ahi tuna - delicious! Forgot what the 4th ordered but she was very happy with it. Service was great especially considering we were in no hurry to be served or to stop gabbing and leave. No pressure on us to clear out on a very busy Friday. If you're going on a weekend best to get reservations. It's the place I prefer to go for sushi. Always consistently good. Even thought I've been coming here for 15 years+, it's been a while and I'm glad to report the service and food quality is amazing. This was a special birthday celebration and glad to have made the choice to come here with friends and family. Best sushi place. Highly recommend for great food and drinks. Also an incredible staff! Great food as always... (first round of sushi anyway)! Unfortunatly, the server did not visit our table until we asked the bus boy multiple times. It was 25-30 minutes before we had our drinks. Food was good but the server must have been oversat. We were ready to order more rolls and by the time she came back she was ready to give us the check. She did put in a 2nd order with a rush but the quality suffered on that round of sushi (warm mushy rice). Overall, I think they need more servers and this would correct the situation. We will be back, hopefully they hire more staff. Was great food and service will be returning for sure!! Outstanding service and support. I would recommend to anyone. Long time favorite, Erica is always a pleasure as our server. 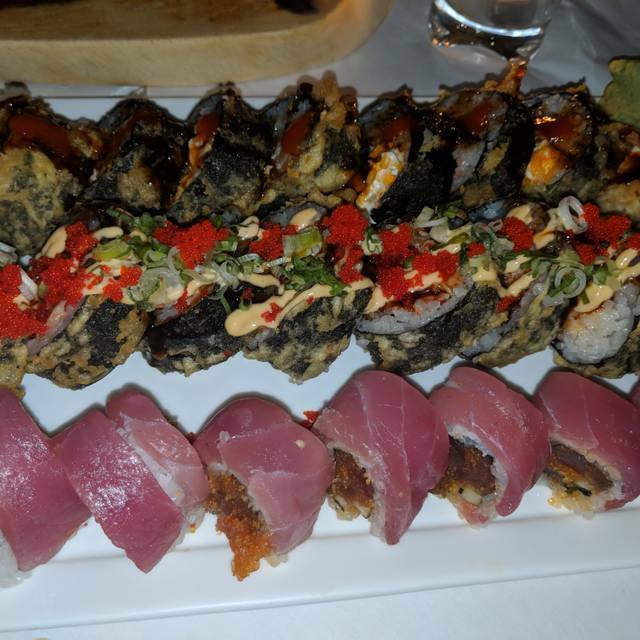 Outstanding alternative Sushi, quality entrees and excellent cocktails. Food is always great but we waited about an hour for our meals to arrive. We purposely made an early reservation in the hope that we would avoid this kind of delay. It seemed there was a lot of take out orders and the kitchen was swamped due to Valentine’s Day. Last time it was a service. Total disappointment! Arrived early for our reservation, hot seated right away. Little did we know that was to be the highlife of the night. Did not see our server for at least15 minutes, took drink order and disappeared for another 10 minutes. Had to flag down bus boy to bring us water. After 1 1/2 hr wait we still did not have our dinner. Mgr. tried to make things right with discount and comping dinner, which we still had not received. Server, Pat, tried to blame it on the kitchen, but other diners were getting their dinner orders. Ruined date night for wife and myself. Food, service, ambiance - all "top of the line". And a kind of special thing on this visit: They have a private room adjacent to the bar area. Very nice - and reasonable. It had apparently been booked by a party of about 12-14 people. When they arrived, they chose to sit/stand at the bar instead of going into the room. That clogged up the walking area and access to tables, and they were extremely loud - each trying to out-shout the others to be heard. The BW management and wait staff - very politely - got them to move their group into the room to make the dining experience enjoyable for both other guests and crew - and for them too! Thank you, Bistro Wasabi. My husband and I eat here every week and our last two visits the food was not good. Normally the food is excellent. Service was excellent. Food was hot and correct. The food was good, but nothing to write home about. Portion sizes were on the smaller side and a bit pricey for the value. Heard a lot of great things about this place, but was simply not impressed. We ate about 5:30-6:00pm on a Wednesday night, so it wasn't really too busy either. After about 15 minutes I had to ask a staff member if anyone was taking care of us. Drinks took about 15 minutes to get after ordering. Food took awhile. Overall it was a two hour dinner after the slow service. Wasn’t expecting that. Once again, an amazing meal at Bistro Wasabi. Pat took great care of us (thanks again)! By far the best Sushi restaurant I have ever been to! Continue to what has become an almost weekly visit here. Being a creature of habit, I've usually been ordering the same things, but several weeks ago I started venturing out with new selections for appetizers, entrees and cocktails. I've yet to be disappointed. I have to say that the servers we get (almost always one of the same three ladies) are just over-the-top in menu-knowledge, drink-knowledge and attentiveness to our wants and needs. I would rate them, and this restaurant, at the top of our "dining out" list. Consistently high quality food, service and fun. This is a regular stop for my family. A regular stop for us. Good food, creative cocktails, excellent service. Service is always great here. Starters are great, the maguro salad is outstanding. Always a heat experience. We loved the food! The server was very nice but the food seem to take longer than the past visits. We not have that stop us from coming back. They were pretty busy.